This is a compilation and repository of everything I know about the farm's history. It ranges from the geology of the valley we occupy through previous owners and my various farming enterprises over the years to the most recent additions of Solar Power and a Wood Pellet Furnace. Lewis Creek runs through the middle of Lewis Creek Farm, and the farm has over 4000 feet of frontage on the creek. 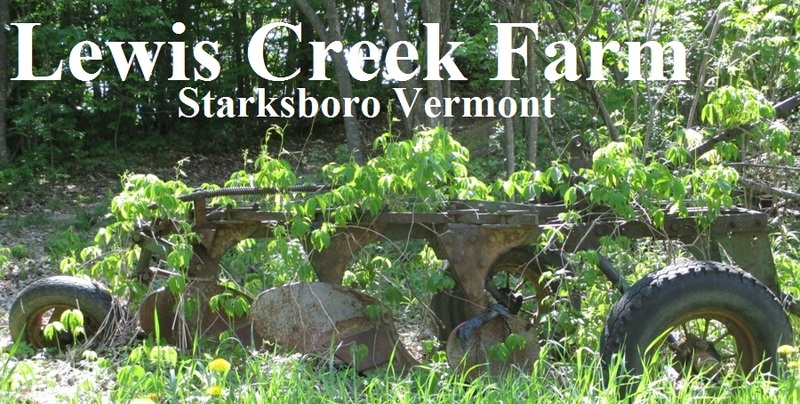 However, it was not until 1981 that the farm became known as Lewis Creek Farm. It is worth noting that many of farms in this valley share similar frontage on Lewis Creek and so until 1981 the farm was known as “The Smith place”, as it was owned by Leroy and Ila Smith. It seems that was the convention. Back at the turn of the 20th century, it was probably known as the “Widow Sayles place"
The main asset of Lewis Creek Farm is its top notch, prime agricultural soils. The farm has about 50 acres of river bottom and river terrace soils. The foremost of these is a soil called “Hadley, fine sandy loam”. This soil was named for Hadley Massachusetts, and is one of the finest agricultural soils in the world. Soil names such as Hadley, refer to the top 40 inches of the soil profile, which makes up the most important and agriculturally functional portion of the soil. The real secret of the soils in this portion of the Lewis Creek Valley is what lies below 40 inches. All of the Champlain valley was at one time a large sea, and the clay soils that pervade the Champlain Valley were laid down at the bottom of that sea, made up of the very fine water suspended particles that took the longest to settle out. This is true even of the soils at Lewis Creek. At about 10 feet below the surface of the soil, there is a layer of clay. This is the same clay that is at the surface in much of the rest of the Champlain Valley. Here at the base of the Green Mountains, however, all the sand that has been washed down off the mountains by Lewis Creek, has been laid down over the clay. The result is that rather than just being a deep well drained soil which could dry out, it has the clay layer at 10 feet which is deep enough to allow for good drainage, but shallow enough to keep the water from draining away completely. It acts rather like the dish under a flower pot: It catches the excess water and feeds it back into the soil from the bottom. It’s never wet and it’s never dry. Below the clay layer is the really cool part. It has no agricultural significance, but still, it’s really cool. On the east and west sides of the valley, there is visible very steep rock faces coming down to the floor of the valley. As it turns out, those steep rock faces keep going, almost straight down… and down…. and down, as much as 500 feet. Between these rock walls the valley has been filled up, layer after layer of sand and silt and clay and gravel and silt and gravel and clay. Layer, after layer, after layer, over 500 feet deep, and at the very top, is a layer of clay and the Hadley fine sandy loam. Geology is so cool. The core of the house, at the back, was originally a simple cape built in 1784 by John Furguson. It was added to bit by bit over the years, and suffered at least one fire as evidenced by the burnt rafters in the oldest part or the house. The front, 2 story, part of the house was built in the mid 1800s during the Sheep Boom. It reflects the farm wealth at that time which came from the sales of Vermont Marino Sheep as breeding stock to farmers in Australia. The wrap-around front porch was a later addition to the house. You can see that it was added as an afterthought, as it overlaps and obscures the top of the window above the front door. The distinctive ornamental loops on the porch, point to it having been added at about the turn of the 20th century. In New England much of the ornamental scroll work is attributed to this period, as a result of the mass production of scroll saws. When I bought the farm, most of the roofs were very old standing seam. Standing seam roofing has a reputation for lasting 100 years. We have had to replace the old standing seam over the years, and quite consistently we find cedar shake shingle in very bad disrepair under it. Approximately 100 years ago the farm was purchased by Edgar Smith (1913) from the estate of the widow Celia Sayles (The widow Sayles). It appears to me that the buildings fell into serious disrepair as Celia Sayles aged, and when it was purchased after her death by Edgar Smith, one of the first things he did was replace the roofing. The building which now serves as the farmstand was originally a Carriage Barn. There are many of these around Addison County, and they are characterized by a very broad span on the front section allowing room for a wagon and team to enter and even turn around. The back of the building had stalls for the horses. The stalls are characterized by heavy double planking and the inevitable “cribbing” or gnawing by the horses. We have made numerous changes to the building, but you can still see some of the gnawed boards from the horse stalls at the back by the produce washing counter. When I originally bought the farm in 1981, the Farmstand or Carriage Barn was connected to the house by a long shed with a peaked roof that ran north/south. It was in very bad condition and when in about 1987 I looked to see what could be done to fix it up a bit, it was plain that the only thing you could do was tear it down and start all over again. In 2001 on Town Meeting day, we had very heavy snow fall which left about 3 feet of snow. I went up on the roof of the connecting shed to shovel off the snow. While I was up there, the roof collapsed. Just a slow settling, and I rode it down. Kind of exciting! Fortunately the building was insured. With the insurance money we built the smaller front shed onto the Farmstand and replaced much of the rest of the lost space with a building at the back of the house, which is now used as the office. The Red Barn The big Red Barn is built in a style known as a “Bank Barn”. The style was so named because one side of the barn was built into the hillside, or bank. This allows direct access to the hay mow (Hay mow = Hay loft and the word "mow" pronounced like 'how') by hay wagons, which was very convenient before hay bales, and electric hay elevators. Bank Barns became very popular in New England after 1850, so it seems likely that it was built in the mid 1800s. Like many farms in Vermont, until the early 20th century, the main cash crop was sheep: Meat, wool and the real money maker: breeding stock. When the advent of the railroads made it possible to export milk to the major urban areas, the farm turned to dairy cows. When I first arrived on the scene in 1981 the lower level of the barn was being used for dairy cows, and had in the mid 70s, been converted from tie stalls to free-stall. Edgar Smith bought the Farm from the estate of Celia Sayles in 1913. This was the beginning of the dairy era in Vermont, and the end of the sheep era. During Edgar’s life the farm, like much of Vermont, transitioned from sheep to cows. 1913 was the height of deforestation in Vermont. I never met Edgar, but I bought the farm from his son, Leroy. Leroy described the farm when he was a boy. There is an extremely steep hill at the back of the biggest field (remember the steep rock face that descends to the valley floor? ), and Leroy said that as a boy, it was open land, used for pasturing sheep and cows. Parts of this hillside are sheer cliff and all of it averages a slope of 45 degrees. It seems incredible, and certainly not what we would call either profitable or responsible agriculture, but it sure explains how 95% of Vermont was open land for almost 100 years. I don’t know how long Edgar owned the farm, but at some point Leroy took over the farm from his father. I suspect it was at some point in the 1940s. Leroy didn’t finish high school, but that was not too uncommon in these parts in those days. He married Ila Hill. Ila lived about a mile north in the house at the top of the hill that Ralph and Martha Cota live in now. Ila did finish high school attending the “old High school” on the green in Bristol. In those days it was considered a long way to go all the way to Bristol for school, and as a result, Ila boarded in Bristol so she could go to school, as a daily round trip commute of 22 miles was considered completely impractical. Leroy didn’t much like milking cow, but that was the cash crop in those days, and you did what you needed to survive. Leroy did have a team of oxen, raised from a couple of bull calves from the dairy herd. I have photo of Leroy as a young man and his father, and the team of oxen. Leroy liked the oxen and used them to haul Maple sap in the sugarbush on the hill above the fields. I think Leroy liked almost everything but milking cows, He spoke fondly and enthusiastically of sugaring, and they diversified the farm into laying hens in the 50’s when that was the rage. I’m told he spent a lot of time with a bulldozer down in the Creek, straightening it out and taming it’s unruly ways. When, at some point in the early 70’s the doctor said his back couldn’t take the bending over and rough work of dairy farming, he happily sold the cows and went to work as a carpenter. He rented the farm and barn to someone milking cows. They did that for a while, converting the barn to freestall and adding a milking parlor onto the back side of it. When we bought the farm in 1981 Leroy and Ila had, for the previous few years, been renting the fields to Henry Phillips whose home farm was over on the Prison Hollow road. This farm had been on the market for 3 years when we first saw it. It appears that they started renting out the fields when they decided to sell the farm, and at about the same time they cut off the big trees in the sugarbush for lumber. In 1981Cecilia and I and another couple, Phil Gerard and Elizabeth St. John bought the farm together. The plan was that Cecilia and I would raise vegetables, and Phil and Elizabeth would milk cows. Each couple owned half of the farm, though no specific part. We would rotate the dairy use with the vegetable use. It was a cool plan, but it never came fully to fruition. After a couple of years Phil and Elizabeth broke up, sold their cows, and Cecilia and I bought out their share of the real estate. In 1984 the farm became entirely vegetables, and Cecilia and I ran it together until 2004. I ran the production end of things in the fields and greenhouses as well as the wholesale marketing. Cecilia ran the retail part of the operation, both at the farm and at the Burlington Farmers’ Market. When our son Sam was born in 1988, Cecilia was able to continue running the retail portion of things, largely out of the house, as well as be a full time mom. When we moved to the farm in 1981, I had one sow and 10 new piglets. We made a special trip up from southern Vermont with the sow and piglets in the back of a pickup truck. About half way here, in Ludlow, I pulled over to the roadside and let the piglets nurse. I had pigs for about 10 years here at the farm, ultimately building the herd to 6 sows and a boar. Mostly I sold piglets in the spring. Each sow would have a litter of 8-14 piglets and they sold very well to people who wanted to raise a pig or 2 over the summer. Upon occasion I still have someone stop by the farm and lean out the window of their pickup and ask, "Got any piglets for sale?" It gives me surprising pleasure to reply "I haven't had pigs here for 20 years!" In 1998 we started raising sheep. We had about 5 acres of pasture land that was getting almost no use from the vegetable business. That could be used to pasture the sheep. We had one of our 3 greenhouses that stood empty all winter until early April. That could be used to house the sheep for the winter. We had a well established retail stand where we could sell the meat at retail prices. There were many pieces in position that made it make sense. We bought 6 Dorset ewes and 1 Texile ram from Aurora Farms over in Charlotte. Things went well for a number of years. We fenced the pasture with high tensile electric fence. I learned to shear sheep. We found a near-by slaughter house and designed federally approved labels for the meat (this was before everyone was selling meat and I had to figure the whole thing out myself.) We sold meat from a freezer at the farmstand. When things went smoothly, the idea was that the sheep would pasture all spring summer and fall while we were busy with the vegetables and the time consuming tasks of lambing and sheering would happen in the winter. As I said, things went well for a number of years. However, in about 2004 or so I bought some more ewes from a farmer over in Randolph Vermont, and as it turns out, one of these sheep knew how to escape through a fence, and she taught all the other sheep how to get out. As a result, we spent all of one summer chasing sheep around. They’d get out and into the neighbors garden, into the road, and into the vegetables. You can’t have sheep running around willy-nilly and so we spent an enormous amount of time chasing down sheep, when we should have been growing vegetables. We sold all the sheep in the spring of 2006. I had raised a small flock of laying hens as a kid in Putney on the old hill farm “Signal Pine Farm” that my parents owned and where we spent summers and winter weekends. Sometime in the mid 1990s I started raising Laying Hens again, here at Lewis Creek Farm. We start them as chicks, keep them on pasture in the summer, and house them in an empty greenhouse during the winter. Chickens love the grass in the summer, and the greenhouse is great in the winter. We sell the eggs at the farmstand, at the Farmers’ Markets, and provide them with our Winter CSA. We’ve been doing this for about 20 years now. It seems to be working well. You may remember the tech Boom of the late 1990s and the effect it had on the labor market. Unemployment was as low as it could get and there were high paying job opportunities everywhere. This made it really hard to get employees for farm work. In fact at the end of the 2000 growing season, we were unable to harvest all our crops because we couldn’t get enough employees. So, in the preparation for the 2001 season, I made plans to get some Jamaicans to help on the farm. The Apple orchards have been using Jamaican workers for over 50 years, and so the connections were there to make it happen. The Jamaicans come as legal guest workers, for a very specific amount of time, with a visa that allows them to work on my farm only and only for a very specific window of time. The program that makes this possible is call H2a. The red tape involved is enormous. I have to demonstrate to the department of Labor that I cannot get US workers to fill the positions. I have to get them visas through the department of Immigration and Naturalization. I have to deal with the Jamaican Government which doesn't let just anyone go to work in the US. I have to supply housing for them, which needs to meet Department of labor and Department of industry and fire standards. I have to pay their transportation both coming and returning and I have to pay them and anyone else who does the same work they do, the Adverse Effect Wage Rate (AEWR). The AEWR is a wage calculated by the Feds to be the wage that a US worker would need to get if they were to do this job. I can't pay the Jamaicans any more than that or the US workers would say: "Well, if he paid me that much, I'd do that job." And I can't pay them any less, or I'm undercutting the local wage market by bringing in foreign labor. In 2015 the AEWR is $11.26 per hour. In 2006 it was $9.16 per hour. It goes up a bit each year and is the average of a bunch of data collected by the Department of labor, so it's never a round number. Fenugreek greens look a bit like alfalfa, and smells like a cross between curry and fake maple, and is popular among Indians. In 2001 a guy who is a distributor in New Jersey approached me to grow Fennugreek during the months of July and August, because it gets too hot to grow it down in New Jersey. He said he could sell 500 cases a week and that he would pay the transportation down to New Jersey. He distributes produce from Washington DC up through Boston and had special contacts with all the Indian restaurants and stores in the megalopolis. At the end of the 2004 season, Cecilia decided she no longer wanted to work on the farm and went to work for Elderly Services in Middlebury. In November of 2005 Cecilia and I became separated. In March of 2007 our divorce was final. Cecilia's leaving the farm, and later our divorce were 2 big changes. While prior to this I was deeply involved in the physical production on the farm, afterwards I was primarily a manager. I still get to drive a tractor a couple of afternoons a week, and I personally run the Saturday Farmers' Market. I do all of the wholesale and CSA marketing as well as much of the more exotic machinery repairs. Of course I do all of the planning of what we are going to grow, how much we'll grow and just how we are going to grow it. In 2010 The Natural Resources Conservation Service (NRCS) started a new program, in which it was funding most of the cost for High Tunnels. I took advantage of this program and we built a 21' x 100' High tunnel. High Tunnels are greenhouse like structures in which the crop is planted directly in the ground and no additional heat is added other than the natural heating by the sun. This extends the season considerably at both ends and more importantly protects the plants from other environmental factor, particularly rain. The first year we grew vegetables in the high tunnel year 'round, with spinach in the winter, lettuce in the spring and tomatoes in the summer. I was an amazing experience, particularly the Tomatoes. We went from producing 2-3 lbs per plant outdoors, to producing 10 lbs per plant inside the high tunnel. Moreover, in 2009 and 2010 we lost all of our outdoor Tomatoes to Late Blight, but had a full bumper crop of tomatoes in the high tunnel. I had never done much full season crop production indoors before, and I came away saying (laced with my habitual hyperbole) "I never want to grow outdoors again!" In 2011 we built a 28' x 200' Haygrove high tunnel especially for growing Tomatoes, and moved all of our tomato Production into that tunnel. We produced as much tomatoes in the one high tunnel as we had previously on 2 acres. And... we did not have to spray the tomatoes in the high tunnel, whereas the outdoor tomatoes required frequent spraying. Big improvement! In 2012 and 2013 we added an additional Haygrove each year. We are growing early cucumbers and early strawberries in these high tunnels and have plans to experiment with other crops. One of the side effects of growing in the high Tunnels was, they needed irrigation, and the conventional method used is Drip Irrigation. The first year with Tomatoes in the High Tunnel was our first experience with drip irrigation. In 2011, as a result of the big success in the high tunnel, we converted the entire Plateau ( a very dry field) to drip irrigation with tremendous success. In 2012 we installed solar panels on the south facing roofs of the Farmstand and office. It's a 10 Kw system producing about 11500 Kw of electricity each year. It is a Grid-tied system which feeds the excess production back into the power grid running our electric meter backwards, rather than storing it in batteries. I applied for a USDA Reap Grant (R.E.A.P = Rural Energy for America Program) to help pay for it. It was a full blown Federal grant application and it was a lot of work to write. But in the end I got the grant! Only after I had written the whole grant and submitted it, did I find out that usually people hire a professional grant writers to write a grant like that. That discovery made me particularly proud when I got the grant. The Solar panels produce about 40% of our total electricity use. We use a lot of electricity here on the farm, mostly for refrigeration. Every day in the summer we harvest vegetables, put them in the cooler to cool them down and then sell them to someone. The next day we harvest more hot vegetables, and put them in the cooler, and so it goes day after day. That's a lot of refrigeration. In the Summer of 2014 we installed a Wood Pellet Furnace to heat the Greenhouse and the winter Storage area. A large portion of our fuel consumption is in heating the greenhouse. It's probably 50% of our total fuel consumption and carbon footprint. By switching from fossil fuels to wood pellets have halved our carbon footprint. We are at this writing (April 2015) at the end of the first heating season with wood pellets. Fuel Oil prices had been very high early 2014 and went down sharply for the 2014-15 heating season, so in our first season heating with wood pellets we haven't saved as much money as we had hoped. However the System worked very well, and when fuel oil prices go up again, as they surely will, well be in a position to save a lot of money on heating costs, as well as the reduction in our carbon footprint.